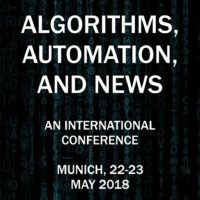 Algorithms and automation increasingly are connected to many aspects of news production, distribution, and consumption. We invite original, unpublished papers to address such issues at an international conference to be held at the Center for Advanced Studies, LMU Munich, May 22-23, 2018 — shortly before the ICA annual convention in Prague, not far from Munich. July 15, 2017: deadline to submit abstracts for proposed conference papers; abstracts should be 500-1,000 words in length (not including references) and sent to conference@algorithmic.news. Please also include a 100-word biography of each author and 6-8 keywords describing your proposal. Work should be original, not previously published elsewhere.